Tag Archive | "eye candy"
Dutch Master daffodils, Involve tulips and Muscari provide several layers of color in the garden. Don’t overlook those shady spots. Many of these locations provide enough early season sun, before the trees leaf out, for bulbs to grow and flower. Use more shade tolerant spring bloomers like snowdrops, grape hyacinths, scillas, anemones, daffodils, fritillarias and Camassias in shady areas among hostas, ferns and other shade tolerant perennials. Combine several bulbs that bloom at the same time to double the floral impact or at different times to extend the color throughout the spring. You can create your own combinations or look for prepackaged combinations prepared by experts like those at Longfield Gardens (www.Longfield-Gardens.com). Low growing White Splendor anemone along with Ocean Magic grape hyacinth make a striking combination for under shrubs. 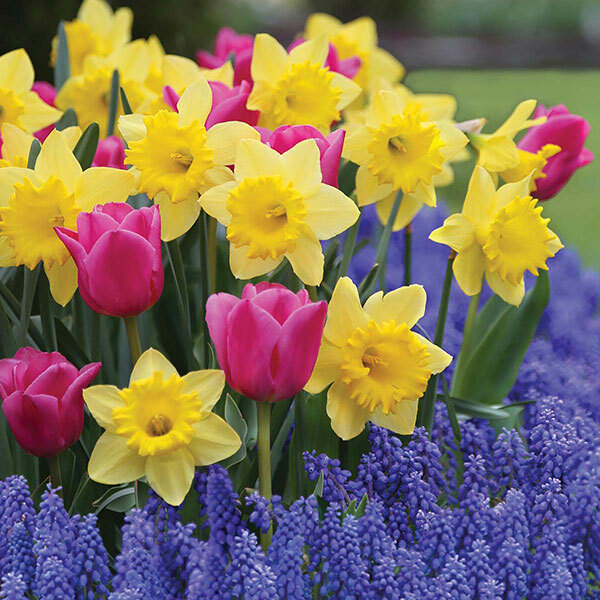 The yellow blossoms of Dutch Master daffodils, pink Involve tulips and purplish blue grape hyacinths will give you several layers of color in the garden. Increase growing success in poor soils by incorporating several inches of compost, peat moss or other organic matter into the top 12 inches of soil. This improves drainage in clay soil and the water-holding ability of sandy and rocky soils. Then be sure to incorporate a low nitrogen, slow release fertilizer.